Outdoor Cooking Channel | Grilling With Beer! 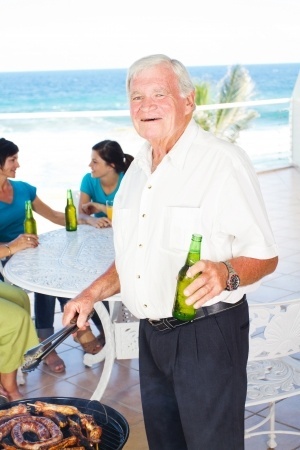 When you read the title of this article, many may have thought, “I always will with beer! If I don’t have a beer either in my hands or within reach then I’m not grilling!” Although that’s an important part of grilling for many of us, there is more to grilling with beer than just sipping on your favorite brew! Grilling with beer goes beyond the standard “Beer Can Chicken” that was an instant craze several years ago and using beer when you grill provides a unique way to use the flavors from beer that only beer can deliver. Let’s explore some recipes and techniques that you can start using when you grill with beer. Beer Can Chicken became such a quick craze that there were infomercials being done for products to assist with preparation and grilling. To be entirely honest, those tools are a complete waste of money and grilling a Beer Can Chicken is one of the easiest and most delicious ways to grill a whole chicken. To start, rinse and pat dry your whole chicken to prep for your rub (remove any giblets or cavity fillings). Rub down the chicken with your favorite poultry run and let it sit for at least 6 hours in the refrigerator. When you are ready to grill, grab a tall can of your favorite beer keeping in mind that different beers will deliver different flavors. Although I’m personally not a fan of highly produced American pale lager, this would be a good time to use it. Pour out half of the beer (into a glass to drink of course!) and add two cloves of minced garlic, 1 teaspoon of onion powder, 1 teaspoon of red pepper flakes, 1 teaspoon of pepper and the juice of one lemon to the can. Insert the beer can into the chicken cavity so that the chicken stands up right when balanced on the grill and can. Cook over low to medium heat until the internal temperature of the chicken reaches 170 degrees F (the slower this cooks, the better it tastes). Beer can also be used to deliver amazing flavors to poultry prior to actually grilling. Brining is a perfect way to deliver these flavors to poultry and many times cooks and chefs have never thought about adding beer to their brine. Grilling a turkey breast as a perfect opportunity to impress your family and friends with the flavor from a beer brine. A quick and simple beer brine for a grilled turkey breast would include two quarts of water, one cup of sea salt, four cloves of garlic cut into quarters, two onions cut into quarters, two teaspoons pepper, 1 teaspoon of sage, 1 teaspoon of thyme, two bottles of heavy stout beer (like Guinness) and 1/2 cup of barley malt syrup. Add all the ingredients in a pot and heat over medium until completely mixed. Pour into a container large enough for the brine and turkey and let cool. Add your turkey breast (this brine is enough for two turkey breasts) to the brine and let it sit overnight in the refrigerator. When you are ready to grill, pat the turkey breast completely dry and grill until the internal temperature reaches 170 degrees (slow and low!). A rub can be used but this bird will stand on its own just with the beer brine! One more way that beer can be used when grilling is injecting a “beer injection” into meats. For some reason, beer works great when grilling poultry and this injection is a perfect addition to your grilled chicken or turkey. – make sure you grill enough because people will be asking for seconds and thirds! Heat until the injection thickens just a little and the let it cool down until only warm. Inject your chicken when the mixture is still warm and grill using your favorite method and small amounts of seasoning. This one is a crowd pleaser! Beer is often overlooked when grilling but the simple fact is that it delivers flavors that cannot be achieved without using it. There are thousands of different beers available and each one has its own flavor profile that you can use with all different types of grilling techniques. The ideas above are only a small sample of the ways that beer can be used when grilling and I encourage you to start experimenting with ways that you can bring a new dimension, and new flavors, when you grill!